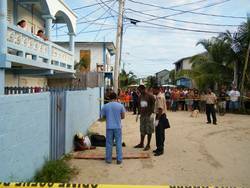 Residents of the San Juan area were awaken by the sound of gun shots in the early morning on Sunday, November 28th. Three gunshots were heard in that area towards the lagoon off Jew Fish Street. Neighbors report seeing a white golf cart, carrying two male individuals immediately afterwards, driving very fast and turning left onto Seaweed Street, heading to the San Juan area. Shortly after, another gun shot was heard in the direction that the golf cart went to. In little to no time, a crowd had started to gather and the police arrived at the scene. The San Pedro Police Department informed us that sometime before 5:40 on Sunday morning, police were called to the corner of Seaweed and Sand Piper Streets in the San Juan Area of San Pedro Town. There, Police observed a dark skin person of Creole descent, leaning in a sitting position on a blue concrete fence with what appeared to be a single gunshot wound to the head. The man who was known to police as Bejon Wade was identified as 20 year old Francis Alexander Figuerroa Cardenas, resident of Belize City, working on Ambergris Caye. Cardenas was allegedly beaten and tortured off an isolated road in the San Juan area after which he escaped and was running for his life when his attackers caught up with him just outside the residence where he was residing. He was shot in the head and left to die. Residents in the immediate area claimed to have heard at least one gun shot after which they observed a cart leaving the scene. Neighbors that quickly gathered at the scene claimed that shortly after hearing the gun shot, they came out to find the now deceased, bleeding profusely from the head. At the scene, police found one expended 9 mm shell. Swift police investigation led to the discovery and impounding of a golf cart fitting the descriptions given to them with blood and another expended shell. Sources within the San Pedro Police Department informed us that the evidence linking the golf cart to the shooting is very strong. On Monday morning, November 29th, the police had in their custody four male individuals believed to either have information about the incident, or are directly linked to the perpetrators of this heinous act. Two of the four men in police custody were assisting the two other men sought by Police for the shooting, to escape to the Mexican community of Xcalax. Police caught up with the individuals boarding a vessel in northern Ambergris Caye. Two of the men secured their escape by running into the bush. Police later reported that a fifth individual, the person believed to be the shooter gave himself up to the San Pedro Police Department later on Monday afternoon. There is always the theory that no crime is a perfect crime. Betting on that, the San Pedro Police Department is asking any member of the public that may have seen anything or have any information that can assist them in their investigation, to please contact the nearest police station. When police arrived at the scene, Mr. Cardenas was still alive. He reportedly succumbed to his injuries around 7:15am on Sunday, while undergoing treatment at the San Pedro PolyClinic. His body was taken to the Belize City morgue where a post mortem examination was conducted on Tuesday afternoon, and declared that Mr. Cardenaz died due to massive brain damage caused by gunshot wound to the head.If anyone has any further information that can assist the Police, you are asked to contact the San Pedro Police Department at 226-2022. Nasser family freed of unlicensed ammunition charges.